Sarcoids are a common, fibrosarcoma-like skin tumor affecting horses worldwide, with a 1-2% prevalence rate. 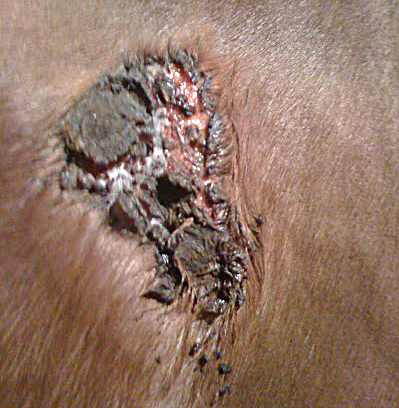 Most are benign and not problematic, however they get to be a problem when they grow larger, ulcerate and located in areas that interfere with placement of tack and equipment on horses for athletic performance purposes. In one form of the disease, tumor cells can spread to the lymph nodes. The exact pathogenesis of sarcoids in horses is not completely understood, however it has been strongly linked with bovine papilloma virus (BPV) type 1 or 2, due to the presence of BPV viral DNA isolated from 73-100% of equine samples studied. The transmission of BPV to horses is not well understood, however it has been demonstrated that it can be spread from horses to horses through direct contact with the skin of affected horses. Face flies are also implicated as possible vectors for transmitting the virus, as BPV DNA has been found in face flies removed from horses with sarcoid lesions. 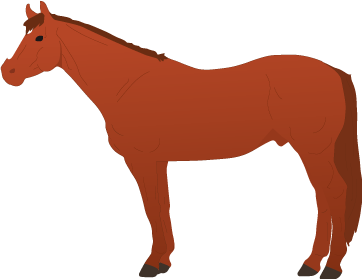 Sarcoids can occur on any part of the horse's body, either singly or in clusters, however it is most frequently found on the ears, head and limbs. 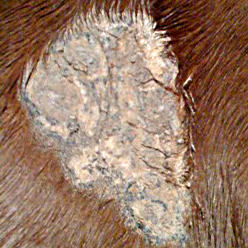 Sites of previous injuries to the horse's skin have an increased risk of developing sarcoids in the future. Thoroughbreds, Quarter Horses, Appaloosas, and Arabians have a genetic predisposition to developing sarcoids. 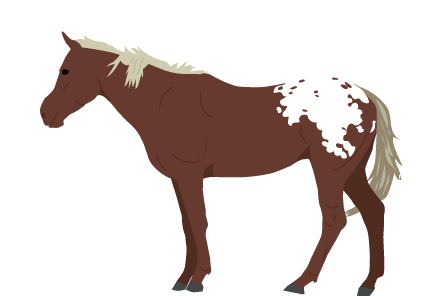 Sarcoids are more frequently seen in young to middle-aged horses. Studies show that over 70 percent of sarcoids develop in horses less than 4 years of age. There are six distinct forms of sarcoids in horses, classified according to gross appearance and behavior. Occult: Flat and alopecic with mild cutaneous scaling. They are the most benign type of sarcoid which often remain quiescent with little change in appearance or growth. Verrucous: Wart-like appearance with a raised, scaly, lichenified appearance with hair loss and epidermal thickening. This type is also generally benign. Nodular: Firm, well-defined, subcutaneous lesions which are freely moveable and with normal or ulcerated skin. Fibroblastic: Proliferative fleshy and ulcerated masses with local infiltration. They look similar to exuberant granulation tissue. Mixed: May include any, or all, of the above-mentioned types and which tend to become progressively more aggressive as fibroblastic transformation occurs. Malevolent: The most rare type of sarcoid and are aggressive, rapidly growing tumors that infiltrate locally along fascial planes and vessels. They are associated with a high recurrence rate and are the most aggressive form of sarcoid. There are numerous treatment options available for horses with sarcoids. The cost of treatment varies widely and usually correlates with the number of treatment sessions required. The success rate of the various treatments varies depending on the number of sarcoids present, form(s), location(s), and stage of progression of the tumor(s). Radiotherapy Uses ionising radiation to kill neoplastic cells by damaging DNA and protein. 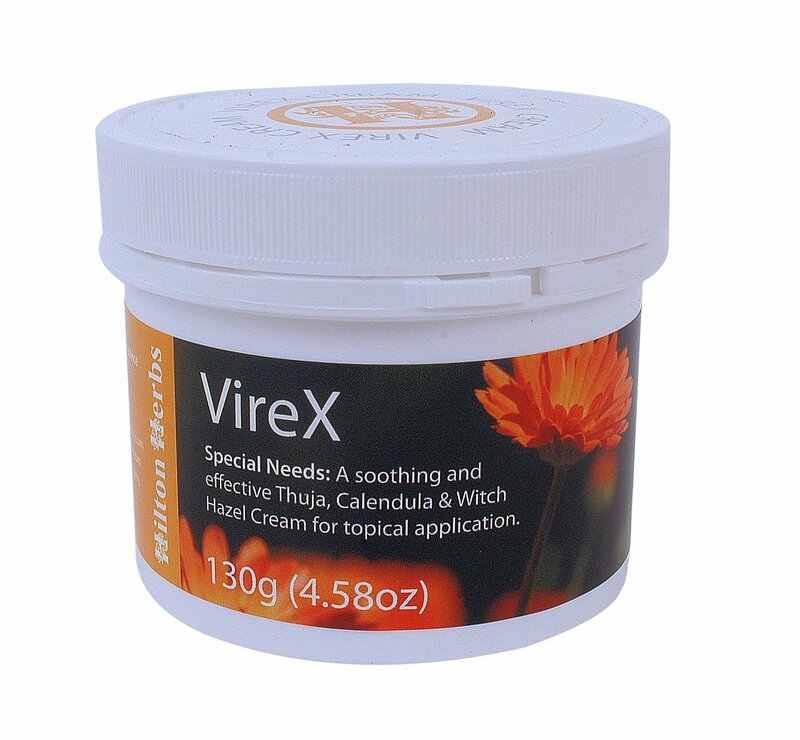 Topical ointments Daily topical application of 5% aciclovir cream for 2-6 months caused complete tumor remission for 68% (32/47) of horses with mild-type sarcoids; with no recurrences reported.